"Longreach" redirects here. For other uses, see Long Reach. 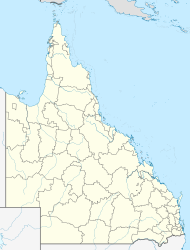 Longreach is a town in Central West Queensland, Australia, approximately 700 km (430 mi) from the coast, west of Rockhampton. The town is named after the "long reach" of the Thomson River on which it is situated. The town was gazetted in 1887, and the railway reached the town in 1892, causing the population to grow. It is the administrative centre of the Longreach Regional Council, which was established in 2008 as a merger of the former Longreach, Ilfracombe, and Isisford shires. The town is on the Tropic of Capricorn. The main industries of the area are cattle, sheep, and, more recently, tourism. A number of Queensland towns have their streets named to a theme. In Longreach, the streets are named after species of birds, with the streets running east-west named after water birds and those running north-south after land birds. The main business street is called Eagle Street. Other streets honour Hudson Fysh, an Australian aviation pioneer, and Sir James Walker, a farmer and long-serving mayor of the former Longreach Shire Council. Notable Australians to have been born or lived in Longreach include former Australian Governor-General Quentin Bryce, iconic Purple Hearts and Coloured Balls guitarist Lobby Loyde, comedian Carl Barron and rugby league footballer Matthew Scott. The world's third oldest airline, Qantas, commenced operating in Longreach - from this hangar - now part of the Qantas Founders Museum. Longreach is the home of the Australian Stockman's Hall of Fame, which was officially opened in 1988 by Queen Elizabeth II. The purpose of the centre is to showcase the history and the culture of life in rural Australia. Since its opening, over 1 million people have passed through its doors. Longreach was one of the founding centres for Qantas, the Australian domestic and international airline, the third oldest airline in the world (after KLM and Avianca). One of the airline's original hangars remains in use at the Longreach Airport and is listed on the Australian National Heritage List. The town is now the home of the Qantas Founders Outback Museum, which includes amongst its displays a decommissioned Qantas Boeing 747-200 aircraft, registration VH-EBQ, The City of Bunbury, and Qantas's first jet aircraft VH-XBA (formerly VH-EBA), a Boeing 707, The City of Canberra. In recognition of the town's place in company history, as well as a play on the airliner's extended range, all of Qantas's Boeing 747-400s have "Longreach" printed on both sides of the first jetway entry/exit doors. The town is home to the Australian Agricultural College's Longreach Campus, which prepares students for work in the agricultural and pastoral industries. It was known previously as the Longreach Pastoral College. The campus was opened in 1967. Adjacent to the college is the Longreach School of Distance Education, which provides lessons to remote students, formerly by HF radio but now using telephone lines. Longreach lay on the traditional tribal lands of the Iningai. Longreach Post Office opened on 1 October 1891. A Longreach Rail Post Office opened by April 1940 and closed in 1962. Longreach State School opened on 22 May 1893 with an enrolment of 102 students. Longreach State High School opened on 24 January 1966. Longreach School of Distance Education opened on 27 January 1987. In early April 2010, Longreach experienced a significant locust plague described by local residents as the worst in three decades. At the 2011 Australian Census Longreach recorded a population of 3,137. Longreach has a visitor information centre, swimming pool, Powerhouse Museum and parks. Shopping facilities in the town include IGA, Foodworks and Prices Plus. Longreach Regional Council operates the Longreach Library at 106 Eagle Street, Longreach. The Longreach branch of the Queensland Country Women's Association has its rooms in Duck Street. The Longreach Leader newspaper is issued weekly. The Longreach area is also served by several locally based radio stations including ABC Western Queensland, and commercial stations 4LG and West FM. ^ Australian Bureau of Statistics (27 June 2017). "Longreach (State Suburb)". 2016 Census QuickStats. Retrieved 23 January 2018. ^ "Where the streets have bird names". ABC Western Queensland. Australian Broadcasting Corporation. 22 February 2013. Archived from the original on 14 April 2018. Retrieved 14 April 2018. ^ "Oldest Airlines In The World That Are Still Operating". World Atlas. Archived from the original on 14 July 2018. Retrieved 24 November 2018. ^ "Longreach SS". Archived from the original on 4 February 2017. Retrieved 1 February 2017. ^ "Longreach SHS". Archived from the original on 4 February 2017. Retrieved 1 February 2017. ^ "Longreach School of Distance Education". Archived from the original on 4 February 2017. Retrieved 1 February 2017. ^ "Millions of locusts swarm Central Queensland town of Longreach". The Courier-Mail website. News Limited. 6 April 2010. Archived from the original on 2 March 2012. Retrieved 16 May 2010. ^ "Locust plague prompts fears for crops". ABC News website. ABC. 8 April 2010. Retrieved 16 May 2010. ^ Australian Bureau of Statistics (31 October 2012). "Longreach (Urban Centre)". 2011 Census QuickStats. Retrieved 9 September 2014. ^ "Longreach Railway Station (entry 601970)". Queensland Heritage Register. Queensland Heritage Council. Retrieved 10 July 2013. ^ "QATB Centre (former) (entry 600663)". Queensland Heritage Register. Queensland Heritage Council. Retrieved 10 July 2013. ^ "Qantas Museum/Former Qantas Hangar (entry 600664)". Queensland Heritage Register. Queensland Heritage Council. Retrieved 10 July 2013. ^ "Longreach Powerhouse (former) (entry 601541)". Queensland Heritage Register. Queensland Heritage Council. Retrieved 10 July 2013. ^ "Powerhouse Museum Longreach". Archived from the original on 17 October 2017. Retrieved 1 February 2017. ^ "Longreach Library". Public Libraries Connect. State Library of Queensland. 18 August 2014. Archived from the original on 24 January 2018. Retrieved 24 January 2018. ^ "Longreach Leader". Archived from the original on 4 February 2017. Retrieved 1 February 2017. ^ "Climate statistics for Australian locations - Longreach Aero (records began in 1949)". BOM. Archived from the original on 14 July 2010. Retrieved 16 May 2010. ^ "Climate statistics for Australian locations - Longreach Aero (records began in 1949)". BOM. Archived from the original on 21 September 2018. Retrieved 21 September 2018.